Simon Hughes admits that the party’s election results were “disappointing” and that the local income tax policy was partly responsible. 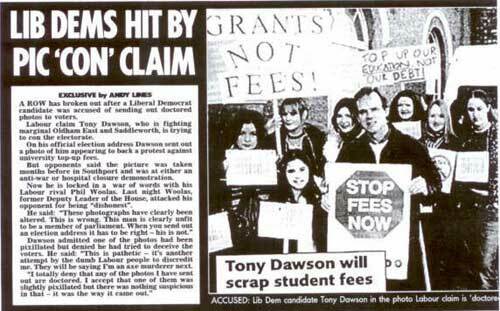 Failed Lib Dem candidate Tony Dawson has been caught out doctoring photos on election leaflets. Lib Dem councillors have been defecting to the Conservatives in their droves. I hope that you don’t pay to much for the domain name of this awful site. It doesn’t represent a fair or even remote fairness to anyone or anything. You just slag off liberal democrats. The problem with politcal parties is that they are all made up of diffeent people even the torries have their share of idiots… If you are going to slag of politicians and political parties at least do it fairly. ← John Hemming MP, The Love Child And The Libel Action?